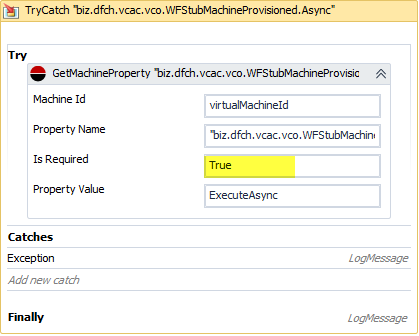 When retrieving a machine property in the Workflow Designer of vCAC that does not exist and later on access the internal workflow variable holding that machine property value you will receive a “System.NullReferenceException”. When using a “TryCatch” activity to react upon this condition an exception is only triggered when you set “Is Required” to “True” (regardless of what you defined in your catch block). As a workaround for you can also pre-initialise the variables in your workflow and then you might not have to use the “TryCatch” activity at all.